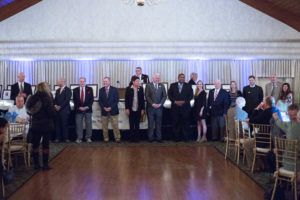 The mission of the Bucks County Sports Hall of Fame, a non-profit organization, is to recognize individuals who through their commitment, sacrifice, and dedication in amateur and/or professional sports at the post high school level have brought pride and distinction to the county. Those inducted have represented athletics with the highest standards of fair play, honesty, integrity, and sportsmanship and have continued to exhibit these standards throughout their lives. The Bucks County Sports Hall of Fame is a chapter of the Pennsylvania Sports Hall of Fame. The purpose of our organization is to honor those Bucks County individuals whose credentials in athletic achievement merit induction into the Pennsylvania Sports Hall of Fame. For this reason, induction into our chapter hall of fame requires exceptional credentials. Honorees are nominated and elected to the Bucks County Chapter and the Pennsylvania State Halls of Fame by our members.You can learn how to become an active member. NO OFFICER IN THE LOCAL CHAPTER IS PAID. WE ARE ALL VOLUNTEERS. MEETINGS ARE HELD THE SECOND TUESDAY OF EACH MONTH AT THE BUCKS COUNTY VISITOR’S CENTER AT NOON.